We only have eight days until Christmas! How has time flown so fast?! If you still have some last minute shopping to do, fear not: Amazon Prime has got you covered! Order today and receive your Christmas gifts by Wednesday! Plus: free shipping! Guys are always the hardest for me to shop for, so I always leave those gifts until the last minute. 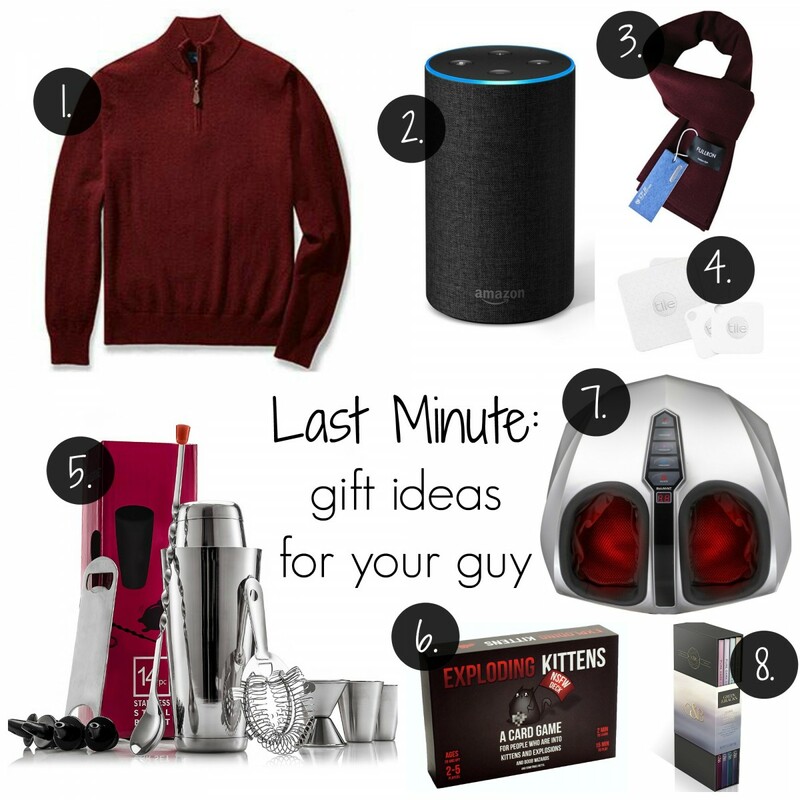 Here are some gift ideas for your guy that you can have wrapped and under the Christmas tree with plenty of time before the big day! Question of the day: Are you all done Christmas shopping? I included the same Green & Black chocolate on my holiday gift guide! Always looking for gift ideas for my boyfriend… often the most challenging but also most fun and rewarding to shop for! Awesome last minute gift ideas! My dad will love the pullover because it loves cozy items! Oh, I love these gift ideas! Austin and I both could use the Key Finder! Great list! What I am having trouble with is my inlaws! EEK! My dad got the Google equivalent to the Amazon echo and he loves it. I kind of wish he would have waited and I could have gotten it for him for Christmas. I always get clothes for my hubby at Christmas because he HATES shopping! It’s a win because then I get to pick out his clothes haha! These are all great ideas! I still have a few gifts I need to pick up for my hubby. Oh, my goodness! A foot massager with heat function?!? I do need this for myself! I didn’t even know they existed!